Prior to the American Civil War in 1861, armies throughout the world were equipped with single-shot rifles. On one occasion during the Civil War, a unit of the Union Army, equipped with magazine rifles, beat off the attack of a regimental sized force armed with single shot rifles. In 1877, the Turks, equipped with Winchester repeating rifles again successfully demonstrated the advantage of the magazine rifle when they successfully repulsed mass attacks by the Russians at the Battle of Plevna. On each occasion the rapid rate of fire of the magazine rifle won the day. Soon most of the armies of Europe adopted the magazine rifle. Germany was the first nation to fully re-equip but pending the results of trials with smokeless powder the 11 mm Mauser Rifle, weighing 4.6 kg was adapted to take a magazine. It was then realized that if the advantage of rapid fire was to be fully achieved the size of the bullet would have to be reduced, in preference to increasing the payload of the rifleman, to allow him to carry more rounds. In 1887, the British Army issued the .303-inch (7.7 mm) Lee-Metford Mark I Rifle as a replacement for the .45-inch (114 mm) Martini Henry Mark III issued in 1871 and the .402-inch (102 mm) Enfeld Martini Rifle issued in 1886; the accompanying bayonet had a 12-inch (33 cm) blade and weighed 15oz (.48 kg); the magazine held eight rounds each having a brass cartridge and being filled with 70 grains of fine black powder. In 1892, the Lee-Metford Mark I was issued and in 1898, he year prior to the Boer War, the Lee-Metford Mark II Rifle was issued to the British Army. The latter two rifles had cordite filled rounds. In 1900, the Lee-Enfield Magazine Rifle Mark I was produced. It had a detachable 10-round magazine box. It was made available for colonial troops fairly readily but as the British Army had been re-equipped with the Lee-Metford Mark II, the latter was the personal weapon for the British infantry soldier in South Africa. In 1897, the British cavalry were issued with the .303-inch Lee-Enfield Carbine Mark I. The carbine weighed 7lb 7oz (3.4 kg) against the 9 1/4lb (4.1 kg) (of the Lee-Enfield Rifle; the backsight was scaled to 2,000 metres against the 2,800 metres of the rifle. Meanwhile, in 1889 in Germany, the Mauser Rifle superseded the converted Mauser. This rifle weighed 4.3 kg had a calibre of 7.92 mm. It was fitted with a 5-round magazine filled by pressing the rounds from the clip. Experience in the Boer War led Britain to adopt the European system for loading in bundles of five rounds. The Lee-Metford Mark II Rifle was converted to this system in 1902 and in the same year the Lee-Enfield Rifle using the same technique was issued. In 1899, the British Army adopted the Maxim Automatic Machine Gun. It was a water cooled .303-inch weapon with a rate of fire of 450 rounds per minute. When filled, it weighed about 70 lb (32 kg). A converted Maxim Machine Gun was adopted for service too. It fired a 1 lb (0.5 kg) percussion fused shell. It was known to the troops as the "Pom Pom". 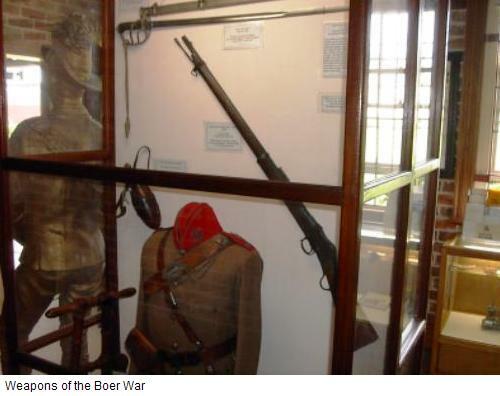 Both weapons were used extensively for the Boer War. CLICK HERE for more information on Machine Guns in the Boer War. CLICK HERE for more information on Pom Poms in the Boer War. Text courtesy the Australian Light Horse Association, images courtesy the New South Wales Lancers Museum.